With the introduction of webmail and mobile computing I am not sure how many people still have a need for a dedicated email client. If you are coming from the Windows community and you are a user of Outlook or Outlook Express then you will probably be looking for a suitable replacement. 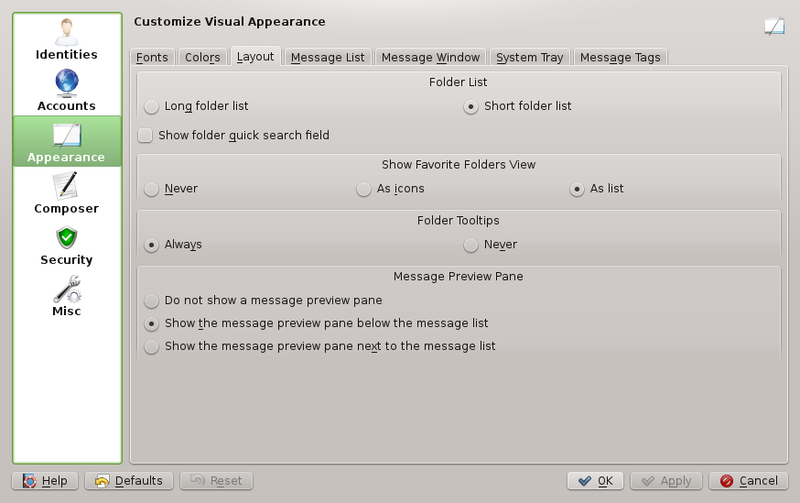 Subsequently if you are used to using the Gnome or Unity desktop environments you may be more used to using Thunderbird. 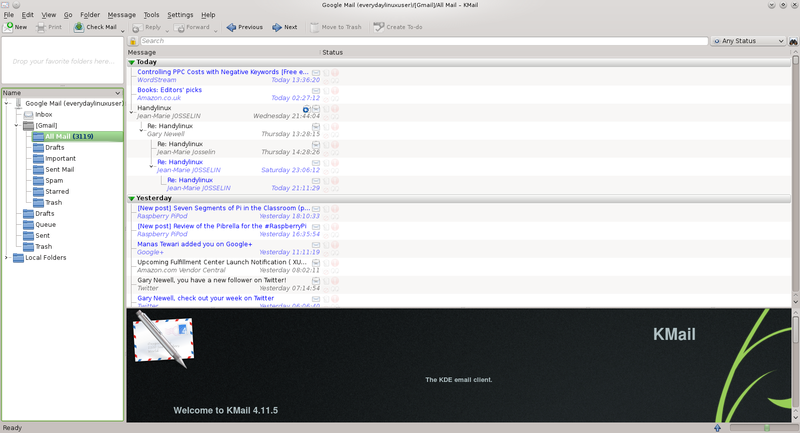 The default mail client with the KDE desktop environment is KMail. It has all the features you could possibly need for home use. The first thing you need to do when you first use Kmail is to add a connection to your email service. If you use one of the common email services such as GMail then setting up your account is as easy as entering your name, email address and password. 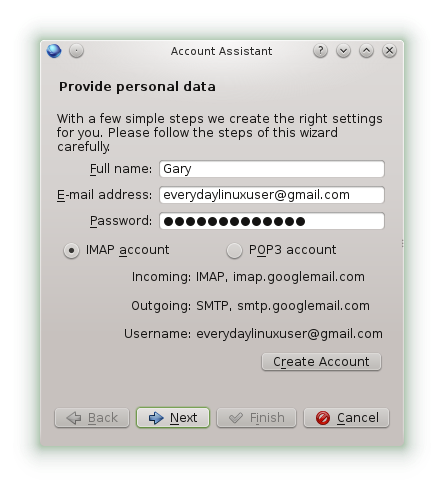 Clicking “Create Account” starts the process of downloading your email from the mail server. Every time you start KMail you will get another tip. You can turn these off by unchecking the “Show tips on startup” checkbox. 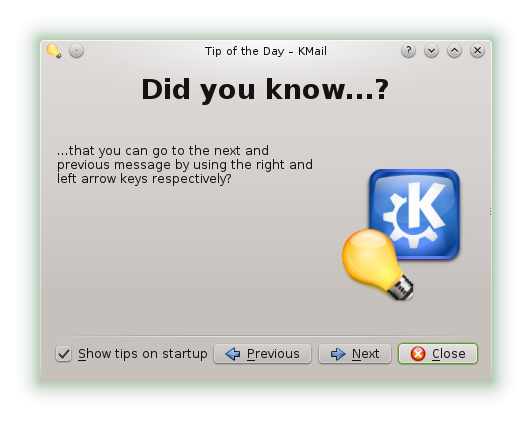 Some of the tips are quite useful so on the first use of KMail you might want to cycle through the tips by pressing the “Next” button. 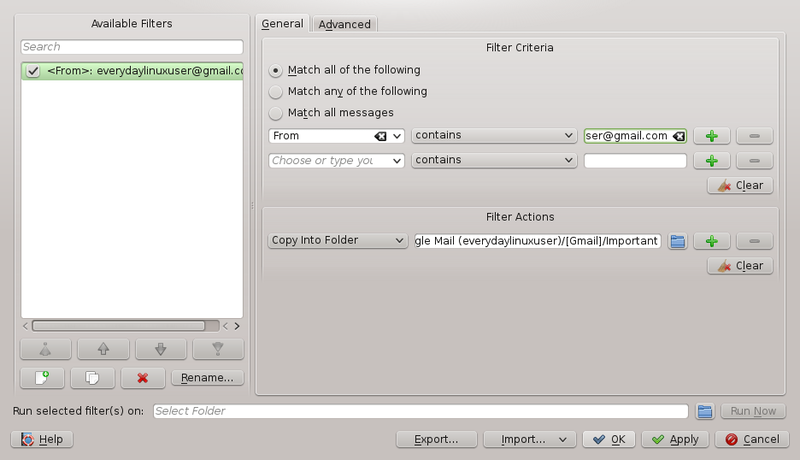 The KMail user interface is fairly easy to use and should be quite familiar to Outlook users. On the left side is a list of folders. If you have multiple email accounts you can set them all up within KMail making them easier to manage. If you have a default email account that you want to use as your favourite you can drag it into the box in the top left corner. The top right corner has a list of your email messages. You can customise the layout of the messages by choosing different themes, Right clicking on the top bar gives you the ability to choose the columns that are displayed. You can also choose how the messages are displayed by choosing how they are aggregated such as flat or threaded. The bottom right pane is used as a preview pane. The layout can be changed so that you have a shorter folder list, the favourites can be plain text and the preview pane can be placed alongside the message list instead of below it. 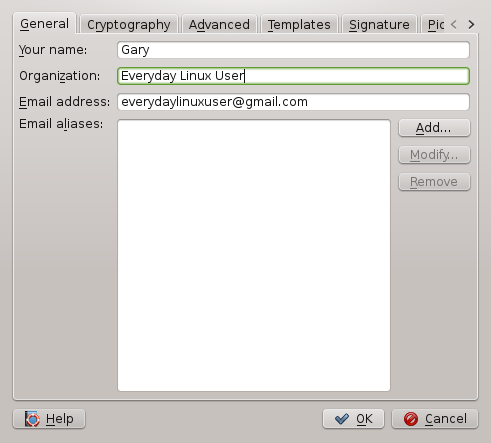 Pretty much everything can be customised within KMail. One of the best features of GMail is the search feature. The GMail search feature makes it possible for me to be incredibly lazy and never delete or organise my emails. If I want to find an email I can just search for what I am looking for in the search box and it seems to throw back the correct message(s) instantly. The KMail search feature is also fairly powerful. You can use the search box to search by keywords and you can narrow the results by filtering by status such as replied to, with attachments, etc. It would be nice to be able to mix and match on the status options. Organising messages can be achieved automatically by using the filtering option. As an example of how filtering works I have added a screenshot above. Basically you can add search criteria and if messages come in that match the criteria you can determine what happens to those messages. 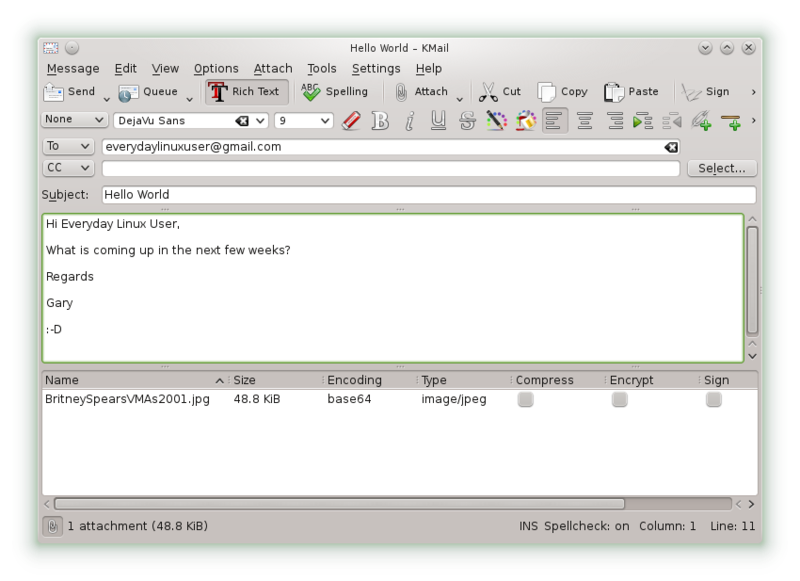 For instance in the example above I have every email from everydaylinuxuser@gmail.com being copied to the “Important” folder. To actually view a message double click on it. You can reply to a message or forward it on by either right clicking on the message and selecting reply/forward or by clicking the appropriate button on the toolbar. Other options include attaching notes to messages or setting up a reminder. You can create a new message by clicking the “New” button on the toolbar. Emails can be created in plain text or you can create a rich text email with bold text, links, tables and HTML formatted items. Attaching files is as easy as clicking a button on the toolbar. To add recipients to the email you can either enter the email address of the person you are sending the email to or if you have people that you email frequently you can use the address book to add contacts. The address book can be found on the tools menu. To add a contact click “New Contact”. There are a number of tabs available including general contact details, the location of the contact, the business the person works for, their personal details such as date of birth, anniversary etc. You can also add notes for the contact and custom fields. 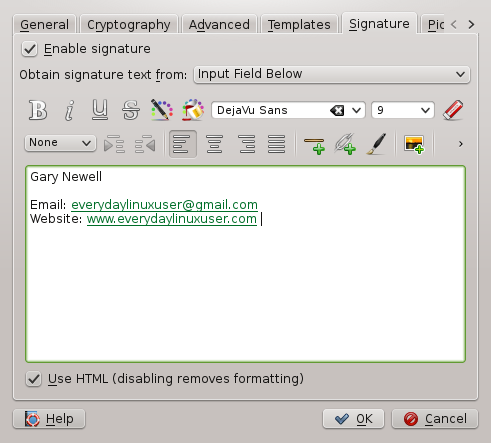 If you want to add a default signature to your emails then you can modify your identity in order to do so. The option you are looking for is under settings -> configure KMail. From the identities tab select your name and click “Modify”. Enter your name in the “Your name” box (I know, who’d have guessed). Enter your email address into the “Email Address” box. To set up the signature click on the “Signature” tab. You can now start entering your signature text in the box provided. The signature can be plain text or it can be in rich text format. The content of the signature can be anything from a few lines of text to a mixture of images, HTML and links. Generally you can send the email by clicking the “Send” button or you can use the “Queue” button to specify a date and time when the email is to be sent. As mentioned previously there appear to be an infinite number of configuration options. 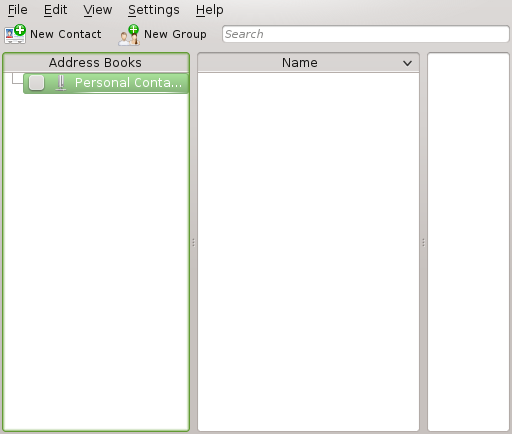 Just about every part of the main messages window can be configured as well as the editor for creating messages. All in all KMail is a decent mail client and if you find yourself having to check multiple email accounts daily then KMail is preferable to using the standard web mail interfaces. KMail is easy to set up and easy to use and has an immense number of configuration options. It is definitely a worthy alternative to Thunderbird and Outlook Express. Does KMail support working with MS Exchange accounts? The best response I found was this one. 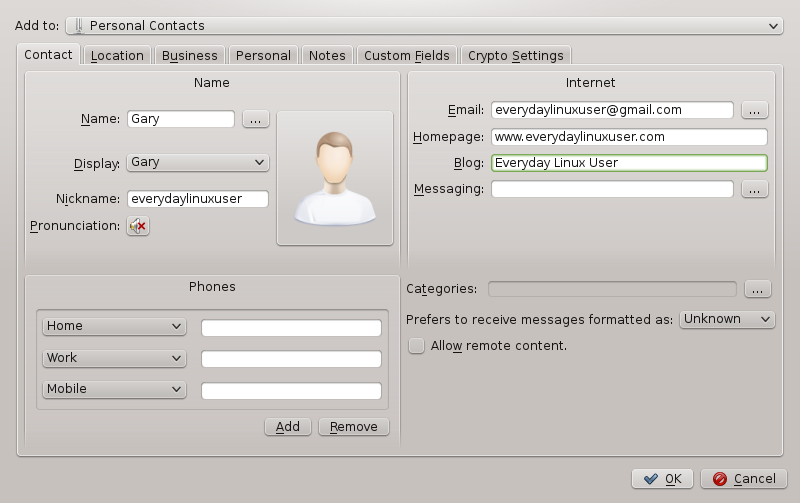 http://askubuntu.com/questions/22977/can-i-connect-to-my-companys-exchange-server-through-kontact.